Great Article about us in Door and Window Manufacturer Magazine! Over the fast few years the troubled economy has been challenging for many retailers. But Ernie Wilding, founder of FAS Windows in Orlando, Fla., says this may just be the year for everyone to see things pick back up. His company, which has 31 employees and two locations, one in Orlando and another in Tampa, is getting involved with everything from blogging to Facebook, and is taking strides to ensure the strength of the company. Wilding is not alone in his endeavors. His son, John, is right there with him. 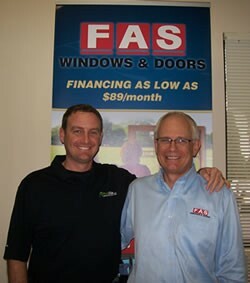 In fact FAS Windows stands for just that—Father and Son Windows—the same name the two once raced under through FAS Auto Sports. Now, the father-and-son team is focused on driving the future of their company. Ernie Wilding took some time to sit down with DWM magazine last week at his head office in Orlando and today we bring you an excerpt of that conversation. What are your thoughts on what’s been happening with the replacement market? The replacement market this last year is a little bit of a challenge, while two years ago we did well–everyone in the industry did well–and one reason for that was the federal tax credit. It made everyone fairly healthy. Then last year we had the Energy Star credit, up to $500, which also helped. This year there is nothing. So we believe the future is rather uncertain. Without those incentives, how do you continue selling energy efficiency to a homeowner? You just sell it. I’ve been in the industry since 1971, and we never had a problem selling replacement products, even during the recessions–and recessions happen every 8-10 years, though nothing like this. The reason we never had a problem is that everyone had value in their homes. When you lose value in your home–and you’ve got houses that have dropped 50 percent in value, plus the foreclosures–what do you do? [In Florida] we’re in probably one of the worst markets in the United States, but we’re blessed because we out-market and out-sell … we’re working very hard (and there is a lot of competition in the area). What have you done to stay competitive? We have a full appointment center, so all calls come into one central where we set up all the appointments for the sales reps. We’ve done that and this year over last we’re up 21 percent for first-time people coming to our site and setting appointments. We’re also doing this though aggressive marketing and that includes TV, radio and web specials and a lot of blogging. And social media? I believe in it. On all of our print as well as TV [ads] and website, we show the Facebook and Twitter logos and ask people to follow us and we continue to get people doing so and we think it’s a great opportunity and we plan to expand that in the next few months. Social media is where it’s at. What are some challenges for replacement market? The only industry challenge we have right now is with the EPA. It’s very difficult. The good news is Florida is not as old as the rest of the United States in housing. Anything older than 1978 we have to test and we do—and that’s the other thing—our competitors don’t test, nor are they certified. We’re totally lead certified and it costs a lot of money to keep that up. And it costs a lot of money if you find a house with lead, and we have to pass [those costs] onto the consumers. What’s the toughest thing about selling windows? Price. We’re competing against those who don’t pull permits and don’t have insurance. And it’s difficult.